Not just a few wondered aloud if actress Mercy Aigbe would have been able to host Best of Nollywood since it would have been her first time of hosting a big event. As such, it didn’t come as a surprise to many that the screen diva went missing in action and didn’t show up to co-host the show as earlier announced by the organisers. Busybodies opined that Mercy’s no-show might have been due to the late realisation that she couldn’t host a show of such magnitude despite initially agreeing to. “When we approached her to host the event, she was enthusiastic about it and we got a costumier to make her clothes. She even went for fittings and only for her to stop taking the executive producer’s phone calls two days to the event,” one of the organisers who refused to mention his name, said. 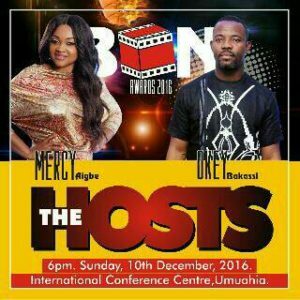 In spite of that, Okey Bakassi held fort perfectly and professionally and kept the show in perspective while ensuring there was no dull moment all through the event that held on Sunday the 10th of December 2016.